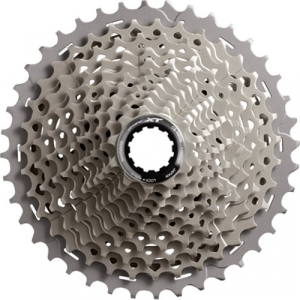 The bomber Shimano XT CS-M8000 11-Speed Cassette, cast out of steel on all but the largest ring, will pair with any Shimano 9/10 speed MTB hubs as well as the DynaSys 11. Rhythm step gearing creates better ratios and smoother shifting, while the nickel-plated finish fights corrosion. Might not be compatible with hubs with tall drive-side flanges.